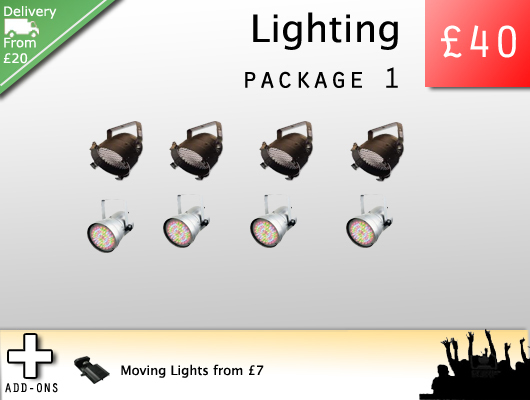 We hire lighting in Kent and Nationwide either as a package or as individual lights. 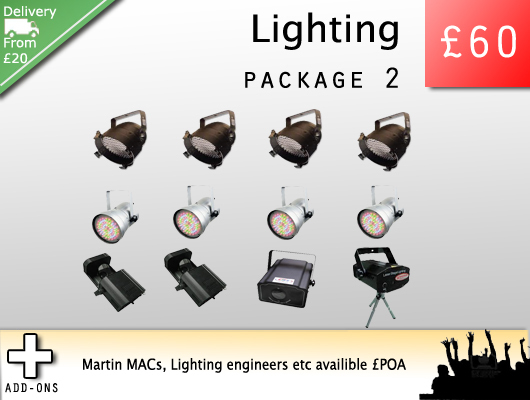 The Lighting Hire stock we offer as packages below is suitable for either stage lighting for bands or disco lighting for weddings and other special events. All of the lighting systems below are ‘semi-inteligent’ meaning that they can be set to trigger from music or controlled remotely by DMX. These systems do not require any special training to set up – just plug in and go! We also hire intelligent lighting systems including Martin Mac moving-head systems for larger events. Drop us a line with your special requirements and we will provide you with a competitive quote.. Lighting engineers can also be hired. To have a look at what these lights look like when in use, go to our demonstrations page.